Running a small business could be compared to juggling, while balancing on a Swiss ball and successfully keeping a hula hoop swinging in motion around your waist, all the while stopping your coffee from spilling. It can be super challenging with a hundred things to think about all at once. Drop one ball or lose your balance and the whole act is in danger of toppling over. There can be some great times, but there can also be some low points where you might wonder why you began your business in the first place. If you are in one of those low points and things aren’t going well, there could be a number of external reasons for it. However, there are also times where the problem is a bit closer to home – something you are doing, or not doing, is holding your business back. The good news is that if you are the problem, you are also the solution! 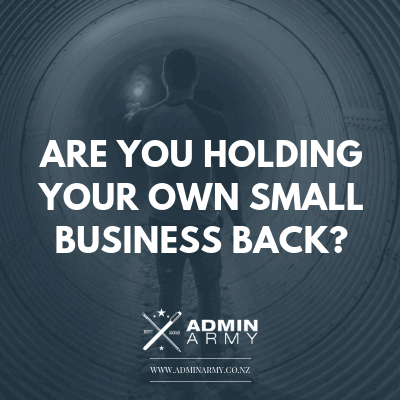 Could You Be Holding Your Own Small Business Back? When you first launch a startup, it is often necessary to become a jack of all trades. Money is tight and you need to handle all the details yourself. Plus, the business is your baby and you want to ensure everything goes as planned. While this may work in the short term, as your business begins to grow, you will need to drop some of the workload so you can focus on core business strategies. Not to mention to avoid burnout from being overburdened. Instead of trying to slog on handling everything yourself, learn the art of delegation. And you don’t even need to have employees to perfect this art. You can outsource to contractors or a Virtual Assistant. Some of the best things to delegate are the repetitive tasks that take up too much time, like bookkeeping or administrative work. If your small business is ticking along well but not growing, beware! It may only be a matter of time before things start to decline if you don’t step up your game. You may abide by the adage, “If it ain’t broke, don’t fix it,” but in today’s world of rapidly growing technology, you need to be one step ahead of the competition. Those old systems that have served you well for ten years can likely be replaced by something more efficient. It may be time to let go of the way things have always been done, and find ways to do them better, cheaper, and more efficiently. If you are not sure where you are going, how will you ever get there? Businesses that lack a strong vision, goal, or mission are far less likely to thrive. But you don’t want to simply look to next week, or next year even. Spend time figuring out where you want to be in three, five or ten years and then break this down into yearly, monthly and weekly goals. Then, work those goals into everything you do in your small business. You will be surprised how much momentum can come as a result of a team working towards a clear, common goal that aligns with your business values. Whether you are scared of failure (or success), or simply afraid to try something new and put yourself out there, letting fear influence your decisions as a business owner is not good practice! To thrive, you need to be willing to innovate, to go out on a limb, to try something different, and to stand out from the crowd. It is good to feel the fear, but don’t let it hold you back. Embrace it instead! If your goals don’t seem a little scary to complete, then you aren’t pushing hard enough! Whatever it is that’s holding you back, face it head-on. Get more experience or training in the area that scares you, hire a mentor, outsource what you don’t understand, and have faith in yourself and your team. If you are ready to stop self-sabotaging and start prioritising your time, then outsourcing could be the solution you are looking for. Get in touch with us here at Admin Army to see how we could take some of those tasks off your hands.